I looked in AMC’s Outdoors with Kids Boston guidebook by Kim Foley MacKinnon and found just the place to explore: College Pond, located behind Burchard Park. Arriving at Burchard Park, we found a convenient parking lot right by the tennis courts. 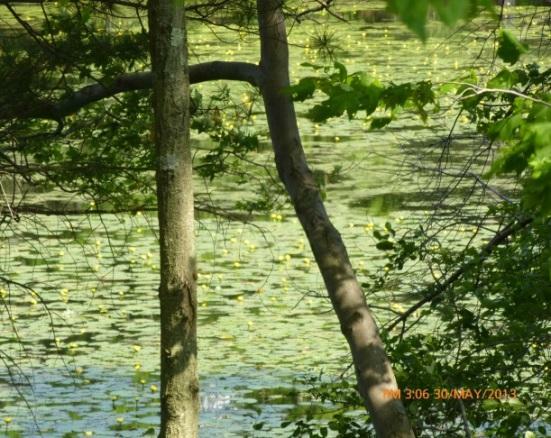 Behind the courts is where the system of trails begins, and you will also see College Pond. My daughter hopped out of the car and immediately spotted a stinging caterpillar. She was thrilled to be outdoors in nature and was ready to go. 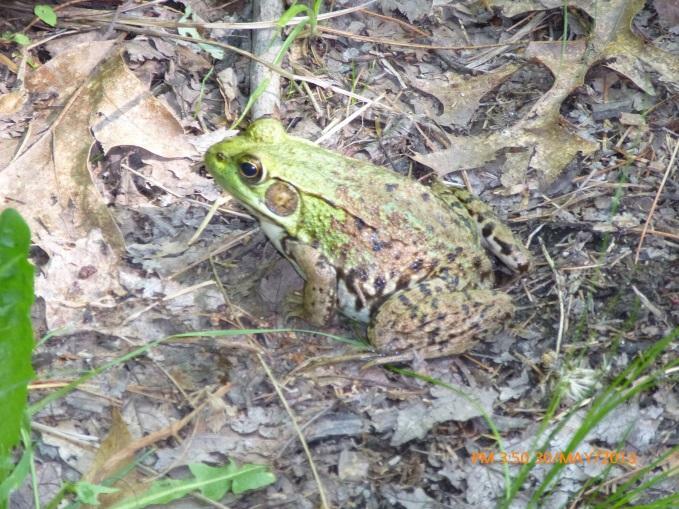 Along the way, we also saw a half-green and half-brown frog! It seemed to stop and pose for us. The pond starts out on your right, and the path is wide. I also decided that as long as I kept the clearing of the pond in sight, we would know our exact whereabouts. The main wide path branches off into many smaller trails. We immediately found a trail with a green tree marker and decided to follow it, always keeping in mind where the pond was. 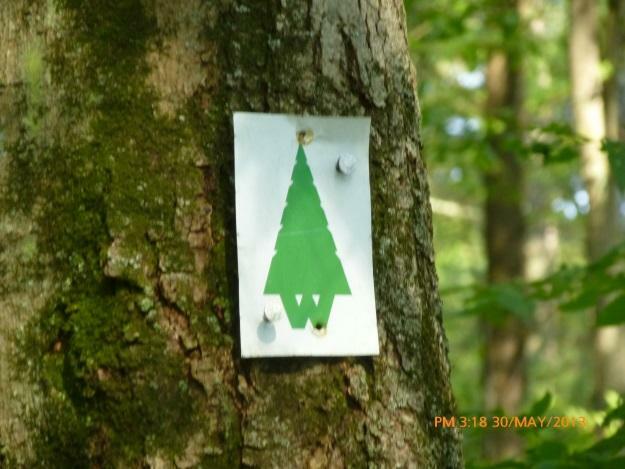 The green markers were sometimes absent at forks, but we were still able to determine the best route. Not long into our walk, we came upon a wooden bridge where my daughter wanted to play with a stick in the water. It was the perfect place to take a rest and also gave us a chance to talk about her day. The amazing thing about this short trip was that I really felt like I was in the middle of the woods. 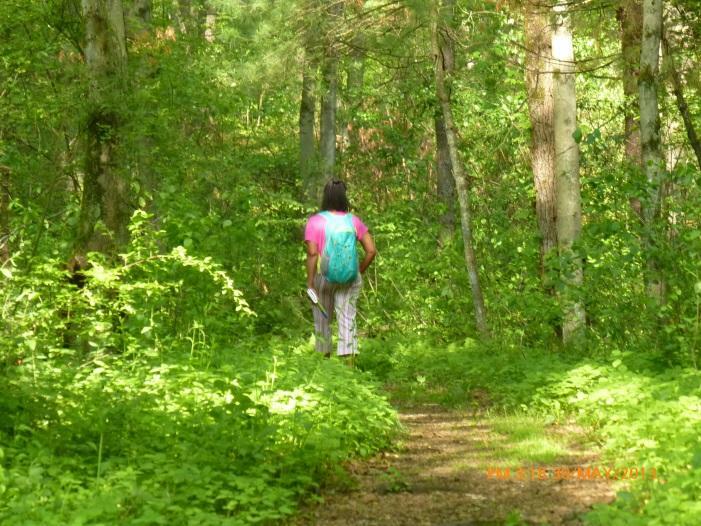 Unlike some other urban/suburban trails where you can sometimes see houses and hear traffic, we only heard birds calling. It was peaceful and a very nice way to end the day. Our next trip will definitely be longer, but I think it is important to remember that even short adventures in the woods can be enjoyable. 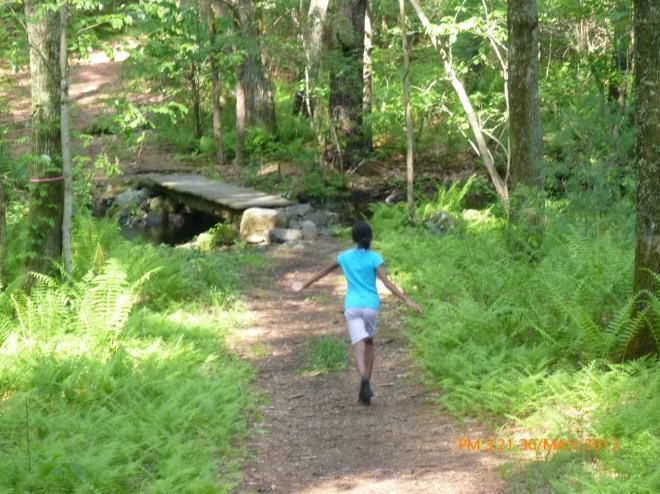 T he AMC’s Outdoors with Kids Boston guidebook recommends College Pond for young children and infants with its stroller-friendly options and plenty of hiking and walking trails. You will find more helpful information on this trip at Kids Outdoors Boston, where you can also comment on this trip pick and give it your own rating! College Pond is open every day from dawn to dusk. Before going, you can print the map by visiting http://westonforesttrail.org/interactiveMap.html. Or you can pick one up from the Weston Town Hall for a fee. 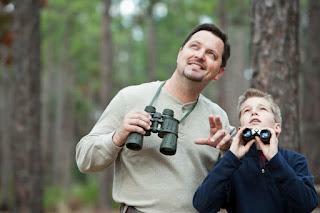 About the blogger: Kai Long is a featured guest blogger as part of AMC’s Kids Outdoors Boston Parent Ambassador program, which partners with local parents to share their outdoor experiences with this online community and beyond. Kai enjoys exploring the outdoors with her 10-year-old daughter and lives just outside of Boston. Stay tuned throughout the summer for monthly blog posts and trip reports from Kai, as well as from other local Parent Ambassadors and AMC’s Outdoors with Kids Boston author, Kim Foley MacKinnon.